Post Size #6, #8 and #10 Heat Shrink pre-insulated Adhesive terminals, connectors and disconnects protect against the most challenging of environments, making the best moisture protection available. They offer several advantages over conventional unsealed products. 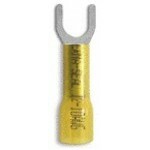 Provides a seal resistant to water, salt, steam and other related contaminants. Improved pullout strength and strain relief, resists abrasion, scoring, cut-through, and the effects of long term aging.